There is a myth that dogs have poor vision. While they see the world differently than we do, dog vision is optimized for what their wild ancestors did: hunt. Dogs can detect tiny movements of potential prey from distances that humans would require binoculars to notice. They aren’t as good at seeing fine detail up close, but they use their other senses to fill in any missing information. Dogs have very acute senses of smell and hearing, as any pet parent knows when their dog howls at the ambulance long before any human hears it. These senses more than make up for any lack of visual acuity. Dogs have excellent vision in low-light due to their high number of rod cells. This is aided by a tapetum lucidum, a layer of reflective cells that directs light toward the retina. The tapetum lucidum is what makes animals’ eyes glow in flashlights and headlights. Dogs are red-green color blind but can use cues of brightness to detect differences in shades they can’t see. Cones are the type of cells that provide color vision. Dogs have fewer cone cells than humans do. Beyond these differences, the eyes of dogs are largely identical to eyes of humans and they develop similar diseases. The rod cells, cone cells, and tapetum lucidum are part of the retina. The retina is the part of the eye that turns light cues into signals for the brain to interpret as objects. 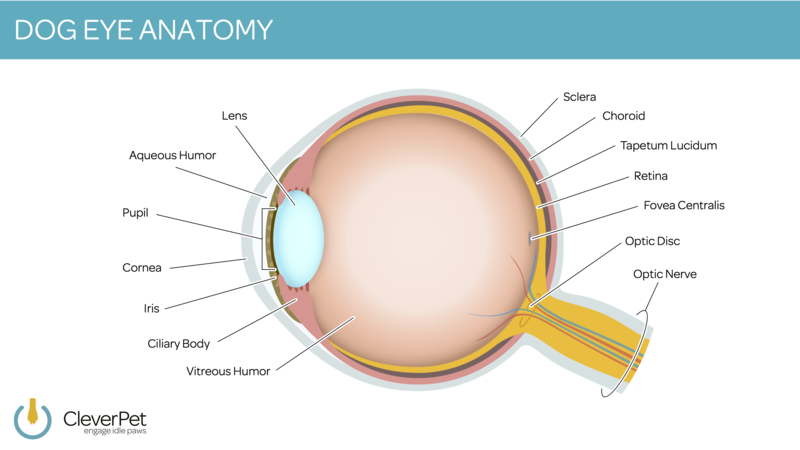 Other important parts of the eye to know are the lens which is responsible for focusing and the cornea which is the clear protective outer surface. The iris is the colored portion of the eye. There are no differences in vision based on the color of the iris. The eye is a very complicated and sensitive structure, which means that there are many opportunities for things to go wrong. Some are due to breed conformation and other issues are due to age, but very few are truly preventable. Brachycephalic (short-nosed) dogs such as Pugs may have eyelids that don’t stay fully closed during sleep. The area that is exposed to air can become dry; known as exposure keratitis,this can lead to ulceration of the cornea. A corneal ulcer is a break in the clear protective coating of the eye. Due to their short noses offering less protection, brachycephalic breeds are also at higher risk from a traumatic corneal ulcer. Trauma – for example, when your cat tells your dog who's boss with a swat across the face – can cause a break in the cornea. Traumatic ulcers usually heal well because the eye is healthy before the ulcer develops. For most dogs, once the ulcer heals (usually in about a week), it’s hard to tell it was even there. However, during healing, the ulcer will cause your dog to squint and have a puffy, painful eye. I recommend visiting your veterinarian for medicated ointment; medication will help the healing process and reduce the likelihood of complications such as infection. Some breeds, like Boxers, are more likely to develop complicated ulcers that require veterinary intervention and minor surgery to heal. Ulcers can also be caused by insufficient tear production, known as keratoconjunctivitis sicca (KCS). KCS is due to inflammation of the tear-producing structures. Dogs with KCS have thick discharge from their eyes. It looks similar to the material that may build up overnight and be easily wiped away in the morning. In dogs with KCS, there is more material and it can even build up on the eye itself. It can be treated with medicated daily eye drops or ointments. Some of the diseases of dogs’ eyes are more common in older dogs. For example, lenticular sclerosis is a haziness of the lens that is a normal part of aging. It’s a side note on my physical exam of most of my senior patients. Lenticular sclerosis makes vision more fuzzy. Cataracts, on the other hand, are a type of crystallization of the lens that prevents light from reaching the retina, causing blindness. Cataracts are more common in dogs with diabetes or in breeds with genetic predispositions (in which case they can develop at any age). Cataracts can be removed and replaced with an artificial lens by a veterinary ophthalmologist. Diabetes causes other problems in the eye too. Glaucoma, high pressure inside the eye, is most common in diabetic dogs. Glaucoma can be very painful and should be monitored closely and treated by your veterinarian. Uncontrolled or severe glaucoma is a common reason for having to remove a dog’s eye. Enucleation, or removal of the eye, is a common surgery performed by veterinarians for both dogs and cats (and cows). It seems drastic because we, as humans, rely on our vision for so many everyday activities. In humans, you may not even know if someone you meet has a prosthetic eye – but a dog with only one eye has the other side sewn closed, making it more noticeable.Enucleation can really be the best option for your dog, especially if the eye is blind, painful, or has cancer. What happens when dogs go blind? When dogs go blind, you may not notice seemingly obvious signs like bumping into furniture – instead, you might notice a change in behavior. Your dog has a mental map of the places she frequents and can avoid objects with only small visual cues, like outlines and shade. As your dog loses her vision, she may be more anxious in new places or when left alone. Some dogs experience night blindness where they can no longer see in low light. Placing night lights throughout the house is a great way to reduce the anxiety associated with diminishing vision by making night more bright. If you think your dog is blind, talk to your veterinarian. The blindness may be due to other underlying conditions that are treatable, like high blood pressure or tick diseases. Treating these conditions won’t restore your dog’s sight, but they may improve his quality of life. Getting eye drops into your dog’s eye can be a challenge, but it's important to find a way to get them in as frequently as recommended by your veterinarian. One technique I tried with my parents’ dog was to let her lick from a can of spray cheese while I approached her eyes slowly from the side with the bottle of eye drops. You might find that this positive reinforcement works well for your dog – or you may need another tactic. Dogs with itchy or painful eyes may feel enough relief from the drops that they don’t mind having their eyes medicated. If you need to put multiple drops or ointments into each eye, you might need to bring your dog into the bathroom for a few minutes so that you can more easily hold his head still. For conditions requiring long-term treatment, it’s very important to find a method that works for both you and your dog. I find the “less is more” perspective often does the job; less restraint can be more effective. By the time the dog notices that something happened, it's over and she can go back to playing. Luckily, serious eye problems are rare. But, since any problem is easiest to treat at the first sign, I recommend having your veterinarian look at your dog’s eyes if you have any concerns. Your dog’s eyes are worth protecting. They are an important part of how we communicate with our dogs and how dogs communicate with each other.